Grand Theft Auto 5 will soon be coming to next-gen consoles. 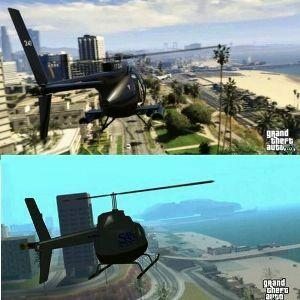 Below is a sneak peak at how GTA 5 looks on the PlayStation 4 compared to its current-gen predecessor. The differences in lighting and reflection are nice, as is the increased number of pedastrians, but it really makes you appreciate how beautiful the PS3’s graphics are – San Andreas and GTA 4 didn’t look nearly as similar.